Casa da Avó Genoveva is an ideal place to unwind away from the hustle and bustle of big cities. It has a privileged location in the centre of the country, and is a stone’s throw away from the mystical and historical city of Tomar (12 km). Very close also are other destinations for pleasant walks as the Almourol Castle (20 min. ), Golegã (30 min. ), Torres Novas (20 min. ), Fatima (35 min. ), Albufeira (Reservoir) do Castelo do Bode (15 min .) Also nearby are the Monastery of Alcobaça, the old town of Batalha and the Atlantic beaches of S. Pedro de Moel, Nazaré, S. Martinho do Porto, etc. 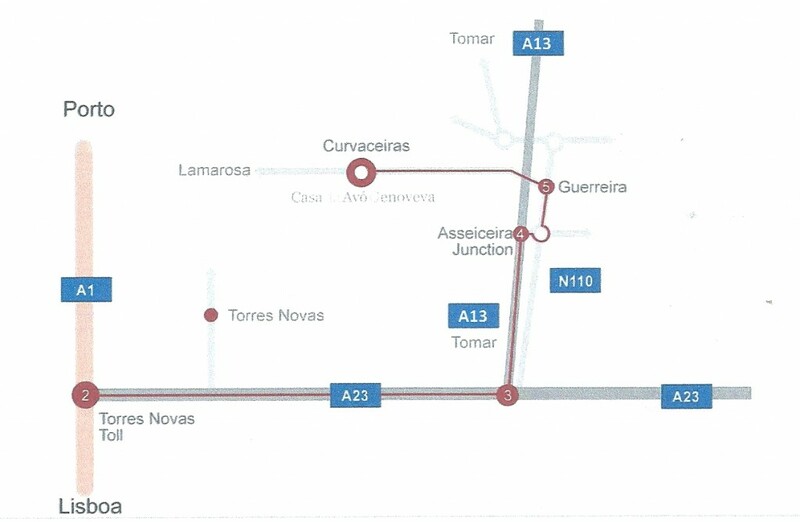 Lisbon is an hour’s drive and the city of Entroncamento (from where trains run to almost all destinations in the country and into Spain) is 12 km away. From here you can visit the Natural Park of Serra d’Aire … and many other places that your imagination may suggest.